When I look back over 2013, many of my fondest gardening memories involve being a Master Gardener. It really was a large part of my life. I completed my training at the University of Rhode Island in April and quickly met the volunteer requirement. In total, I have volunteered almost 400 hours in 2013! 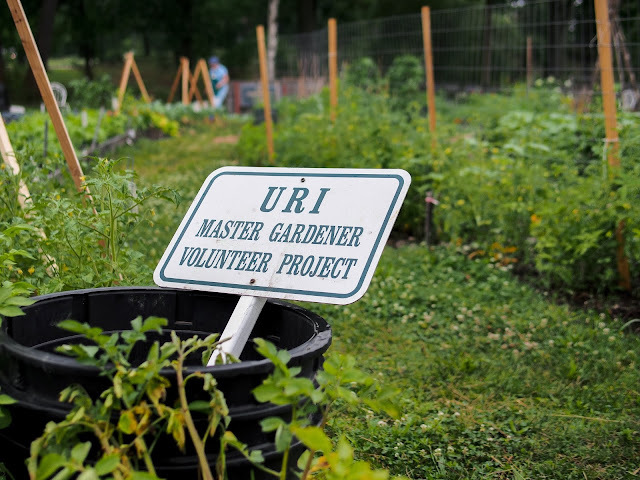 I became aware of the Master Gardeners in 2012 when I volunteered on a new permaculture project, still in the design stages, which was being installed by URI in a large city park near where I live. 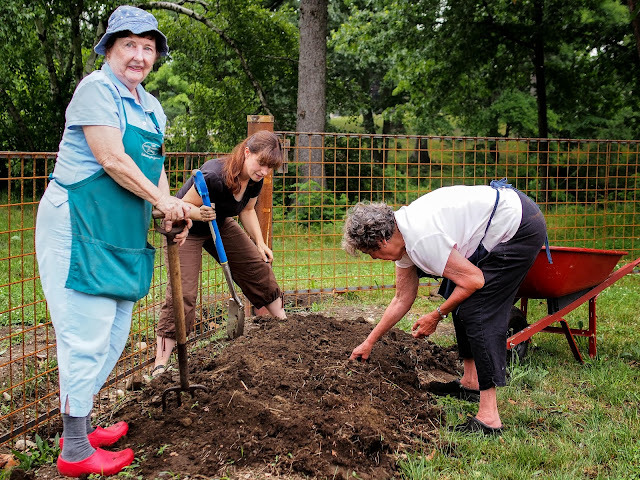 I was looking for a community gardening project to get involved with and this was perfect. Many of the people involved were Master Gardeners and I quickly realized that I had found 'my people'. They had the same passion and drive as I did for gardening and encouraged me to apply for the program. I spent that summer working on the Edible Forest Garden as well as in the adjacent Community Garden where a food donation Master Gardener project was flourishing. Lynne Farr, Me and Sharon Clingham. These ladies are two of the Project Leaders. I do what they tell me coz I love 'em. Over the course of 2013 I found myself involved in a lot of different projects, meeting lots of new people and learning, learning, learning. What I love about Master Gardeners are their willingness to share what they know and their encouragement when they see you pursuing your interests. There are opportunities to learn about any and all aspects of gardening. It is really a lot of fun! 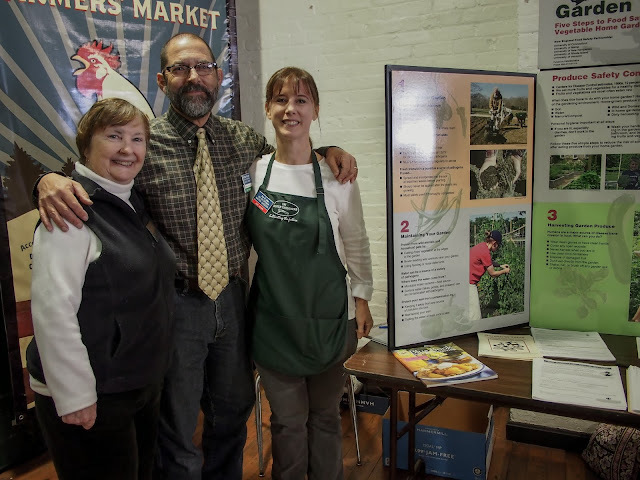 Lynne, Mitch Williams and myself manning the Food Safety Booth at an indoor farmers market. This year I volunteered on: the Edible Forest Project; Rhody Native Projects,which promote the use and protection of native Rhode Island plants in landscapes; the installation of water filtration gardens at Roger Williams Park to address storm water run off; I wrote many blog entries for the Providence Journal's online gardening blog; attended classes to become a Food Safety Specialist and almost completed the volunteer hours and served on the Image Committee. Phew! PDP. Tom Piecuch in the background working hard. My first love, however, remains the Produce Donation Project at the Community Garden. The leaders of this project are very dear to me and one of them, Lynne, is my Master Gardener mentor (I call her Momma Lynne because she takes such good care of me). There are sixteen or so of us who regularly volunteered on this project. We nurtured these plants, from seed and seedling all the way through their harvest and donation to local food pantries and soup kitchen. 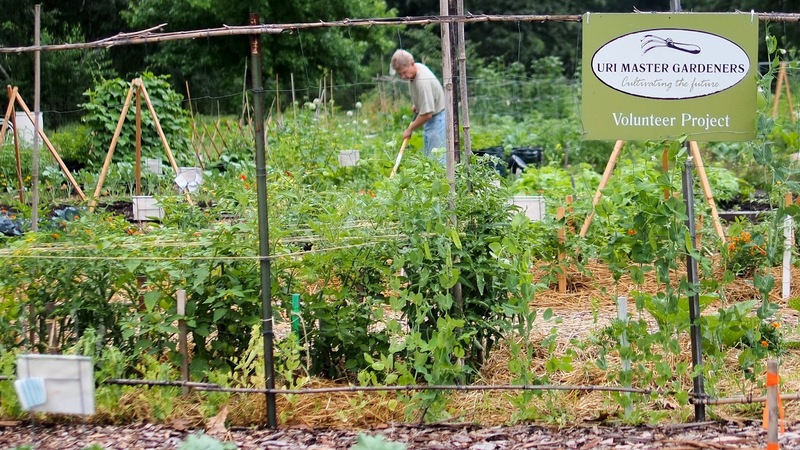 This year we battled disease, pests, weather and produce theft. It was hard work, but I had an absolute blast. We laughed so hard at times it hurt. We despaired over the loss of the entire potato crop, then squealed in glee as we dug up sweet potatoes the size of our heads! 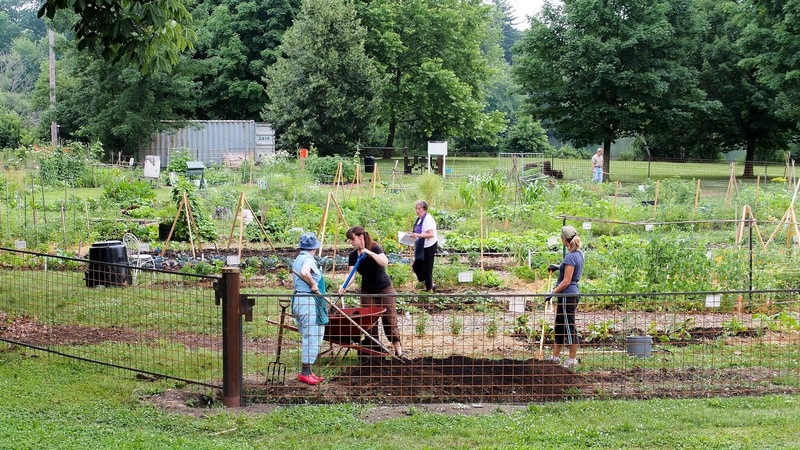 In the end we harvested 1,650 pounds of food that fed those in need in our neighborhood. It doesn't get any better than that. PDP: Tom still working hard. I started writing a weekly newsletter for the Project and that, along with the ProJo blog, really was the impetus behind my starting Less Noise, More Green. I had forgotten how much I love to write and now I had a new passion to write about. Lynne, myself, Sharon and Kathy. The PDP beds are in the front and the community garden beds are in the back. As 2014 begins, the planning for many of these projects will begin as well. I'm excited to see what improvements we will make to the Donation Project this year and what new crops we'll try. 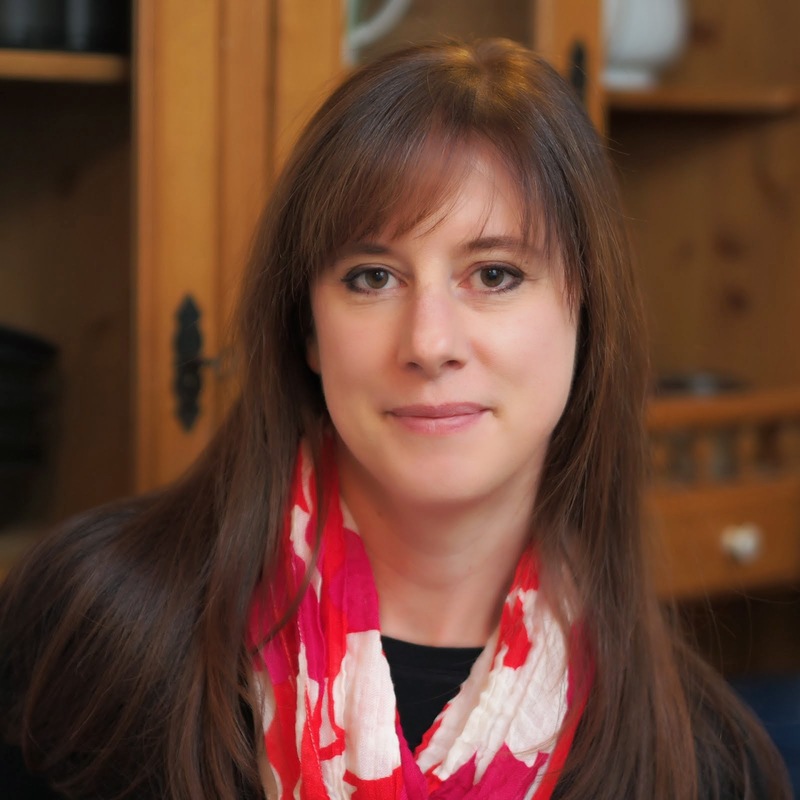 I will be working on some new marketing projects for the URI Master Gardener Association and I'm excited about that as well. In the spring it will be time to roll up my sleeves and get my hands dirty with my friends again. I wonder what they will teach me this year? PDP: This garden is quite magical on a summer's evening. 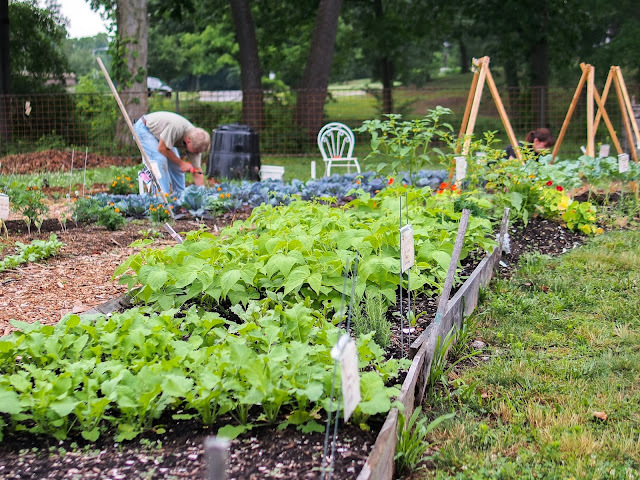 If you are looking for a gardening community to become involved with, I would highly recommend seeking out your state Master Gardener Association. It could be the start of a long meaningful relationship. PDP beds at the height of summer. Did you know Less Noise, More Green has a Pinterest site? Click through to Pinterest using the tab at the top of this page. Hit follow and never miss a new pin!